THR anchor handling winches can be customized with the most advanced technology to get the best solution for the best price. Anchor handling winches up to 300 tons pull with anchor line drums and towing drums, very heavy spooling gear units, warping heads, anchor chain lifters up to 117 mm DAM, and full load proportional veering speed systems can be supplied. THR anchor handlers for extreme tasks. Anchors meed to be repositioned in shortest possible time, to follow the speed of pipe lay. Low pressure hydraulically driven winches were long considered to be the only way to lover anchors at constant speed. The disadvantages of high investment, -energy consumption, -maintenance, the voluminous and bulky pipelines and drive van now be replaced by smarter retarding solutions that THR has developed. Anchor handling winches must take- and give anchors safely from / to the pipe lay vessel in rough seas, without the possibility of the anchors touching the seabed, and without risk of damaging the crane or breaking the anchor lines, whilst the master is busy to avoid touching the pipe layer. 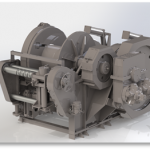 THR’s creativity and knowledge of dynamic winches resulted in AHTS winches which enable full proportional anchor lovering speed with NONE of the above listed disadvantages and dangers. THR AHTS winches are operated very easily in such difficult and very dynamic circumstances with block anchors weighing up to 100 tons. 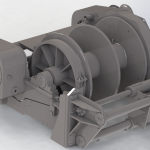 Our patents enable that such superior THR anchor handling winches van be driven by either high pressure hydraulic motors, diesel/ torque converters or frequency controlled electric motors.